If you've been waiting for a powder weekend, then this is it. A parade of storm systems continues to follow the jet stream into the West this weekend. Significant snow is likely for the ski areas. It's a rich feed of moisture stretching far into the Pacific. On the other hand, I don't see much snow for the Northeast. Pacific Northwest: I'm forecasting four different storm systems from Friday through Monday. Each storm is tapping into a rich feed of Pacific Moisture. The ski areas are in for significant snowfall each day. For example, roughly 100 inches of snow may fall on Mount Rainier between Friday and Monday. Roughly 50 inches may fall on Mount Baker between Friday and Monday. California: I'm forecasting up to four different storm systems from Friday through Monday. Very high winds will accompany each storm system—up to 100 mph gusts above tree line. Timing: First wave of snow hits Thursday into Friday morning, then a lull in the action. Up to 24 inches for the Tahoe ski areas. A second wave of snow hits Saturday evening continuing into Sunday morning. Up to 12 inches for the Tahoe ski areas. A third wave of snow hits Sunday evening continuing into Monday morning. Up to 24 inches for the Tahoe ski areas. The fourth wave of snow looks lighter on Monday evening into Tuesday—a couple more inches. Resorts like Heavenly, Sierra at Tahoe, Kirkwood and Northstar will all do extremely well. Four-day totals will range from 2 to 5 feet. Mammoth will also do well. Utah and Colorado: The first wave of snow hits Utah's Wasatch Mountains on Thursday evening into Friday morning, then a lull in the action. Up to 6 inches of accumulation at the ski areas. 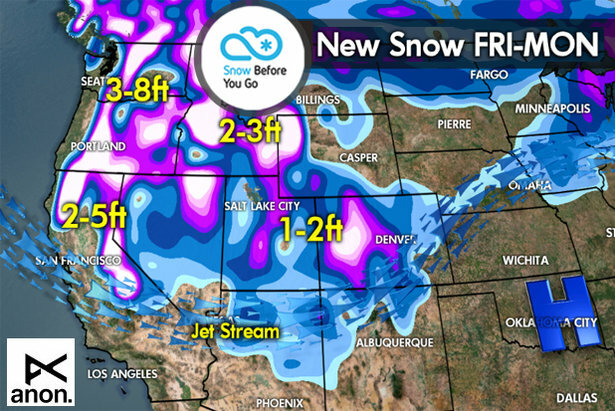 That snow then moves into Colorado's ski areas on Friday. It will snow in Colorado on Saturday as well. We’ll see 4 to 12 inches of accumulation at the Central and Northern Mountain ski areas. A second wave of snow hits Utah's Wasatch Mountains late Saturday continuing on Sunday and into Monday. Up to 20 inches of accumulation at the ski areas. In Colorado, light mountain snow on Sunday followed by a larger storm system with moderate to heavy mountain snow on Monday and Tuesday. Up to 12 inches of accumulation possible. West: The first storm system hits Wyoming, Montana and Idaho on Thursday night, continuing on Friday. A second wave of heavy snow hits Saturday night continuing Sunday and Monday. Up to 14 inches of accumulation with the first storm system. Another 14 inches possible with the second wave. 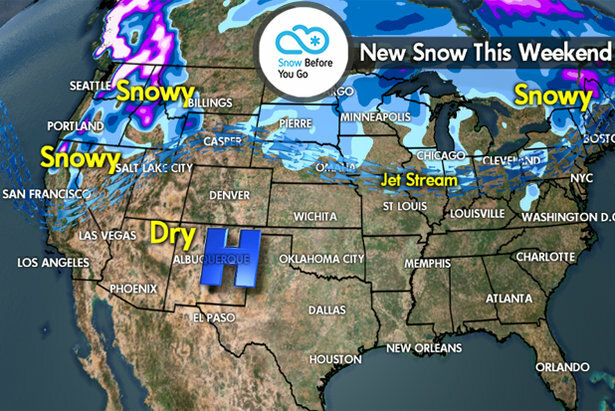 Big Sky, Bridger Bowl, Schweitzer, Sun Valley, Whitefish, Jackson Hole and Grand Targhee will all do extremely well. Northeast: Warm temps may inhibit snow formation except at the highest elevations between Saturday night and Monday morning. At those higher elevation ski areas some light snow accumulations are possible in Northern New York, Northern New Hampshire, Northern Vermont and Maine. But, that's it until Tuesday when some colder air moves in. Tomer's Take: On Friday, ski Tahoe for big powder (consider Heavenly or Kirkwood), Aspen or Vail on Saturday for fresh powder, and either Snowbird or Jackson Hole on Monday for fresh powder.